Takuji Omori always dreamed of staging a kimono fashion show in New York City. The president of Hoshoen and Libre, one of Japan’s leading kimono making companies, Omori wants to show the beauty and tradition of kimono to New Yorkers. Since the earthquake/tsunami/nuclear disaster of March 11, 2011, Omori has been even more determined to produce a fashion show as a way to show his deep appreciation for Americans’ continued support of recovery efforts. 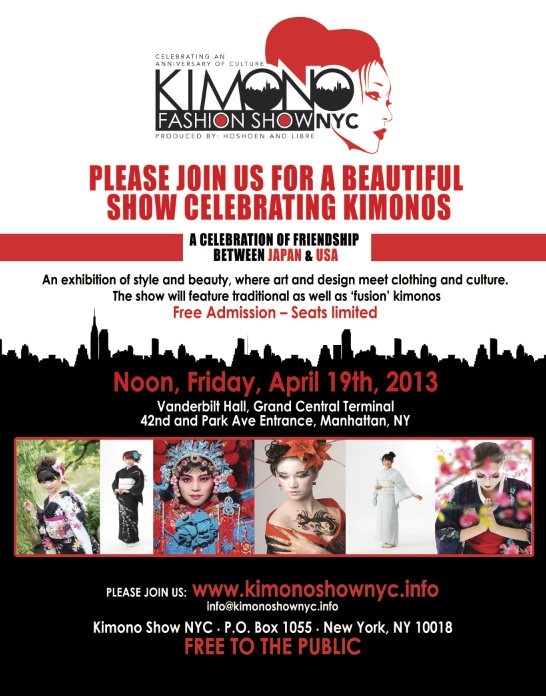 Omori’s dream will come true at noon on Friday, April 19, when Kimono Fashion Show NYC: Celebrating an Anniversary of Culture bedazzles Grand Central Terminal’s Vanderbilt Hall with the beauty of Japan’s historic garment. Japan’s kimono industry is in decline because the Japanese have been wearing Western styles for more than one hundred years, so there are fewer occasions at which to wear kimono. According to Takashi Yawata, Hoshoen’s chief manager, the company is thriving because through Omori’s guidance, Hoshoen is creating occasions such as fashion shows and tea ceremonies that encourage kimono wearing. Eighty-eight women and men from Japan, ranging in age from four to 77, will model Hoshoen’s finest kimono, as well as five “fusion” kimono/dresses created by a design school in Japan. These models are loyal customers of Hoshoen who share Omori’s desire to show gorgeous kimono styles to the world outside Japan. In addition to the 88 models from Japan, 30 like-minded fans of kimono from the New York metropolitan area will participate. Making the arrangements for almost 120 models and producing what promises to be a spectacular, one-of-a-kind event at a historic icon such as Grand Central is a monumental task. Helping Omori coordinate the logistics Stateside are three-time US Olympian and former world record holder in the triple jump Willie Banks and his wife, Hitomi. After a decorated athletic career, Banks spent three years lecturing at Chukyo University in Nagoya. He served as the Deputy Venue Director of the 1994 World Cup of Soccer, the Director of Athletes Services for the athletes’ village at the 1996 Summer Olympics in Atlanta, and a consultant for various cities bidding for the Olympics. Together Willie and Hitomi run HSJ, Incorporated, a company that sells artificial turf to major sports venues in Japan. The Bankses’ involvement in sports may seem an unlikely connection to kimono; however, they are both kimono enthusiasts, and the couple’s youngest son is best friends with Omori’s son. Willie spoke at Omori’s kimono fashion show in Nagoya in December 2011, so he considered helping Omori achieve his goal a worthwhile endeavor. After almost two years of planning, Omori will finally realize his dream of a kimono fashion show in New York City. Unfortunately, he will not see his dream come true in person, as he is ill and unable to make the long trip from Japan to New York. Still, he is pleased to know that New Yorkers will see the special creations of his company and understand his passion for the elegance of kimono. Comedian and TV personality Ray Ellin will host, and Jeri Harris, one of the Radio City Rockettes, is serving as choreographer. The show is free and open to the public due to Omori’s generosity. Seating is limited, so arrive early to see the fabulous kimono designs. Pingback: Fun Links Friday: JapanCulture NYC | What can I do with a B.A. in Japanese Studies?